Sounds good, doesn’t it? Who doesn’t like to shave a few cents off the prices of the goods they’re buying? But that’s where you’re making your first mistake. 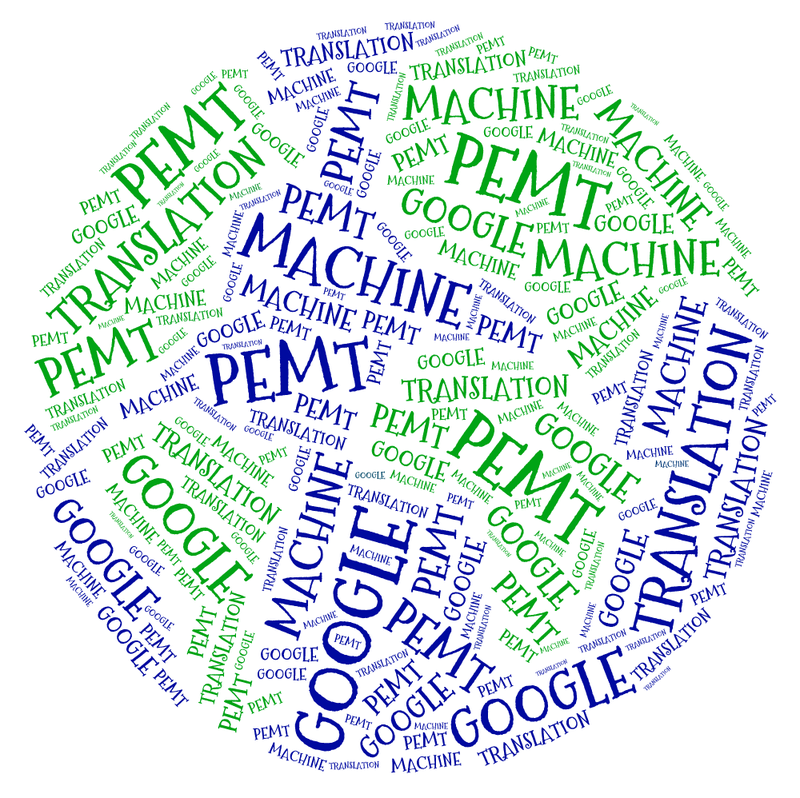 Because translation is not a commodity; it’s a service. You’re not just paying for the end product. You’re paying for the know-how behind the steps to arrive at that end product: a translation that works, that doesn’t sound literal, that isn’t stilted and littered with mistakes, that’s fit for purpose, or, as some say, that sings. But let’s first look at the steps involved in the translation process, because non-translators are often unaware of how complex it can be. 1. Agency/client sends the source text to be translated to the translator. 2. She looks at source text in original language. 5. She checks through translation thoroughly. 6. She sends it back to the agency or another translator for revision. 8. Any issues are discussed and amended. 9. Translator and/or reviser signs off final version. 10. Translation is sent to the client. 2. Resulting target text is sent to translator for editing. 3. Translator looks at source text. 4. He looks at target text. 5. He realises there are lots of mistakes in the translation. 6. He thinks, but his thought processes are muddied by having to read incorrect language patterns and see terms and phrases that are totally odd in the context in question. 7. He looks backwards and forwards from source to target to make sure changes he makes will match source text. This can take a long time. 8. He has to use the mouse to highlight words and phrases to either delete or to cut and paste. This task also eats up lots of time. In fact he might even decide it’s quicker to delete the ‘translation’ of certain sentences and start again. 9. He goes back to the beginning to check it through because he’s made so many changes he needs to make sure it makes sense and flows. 10. He sends target text back to the agency or the client. As this is an editing process, there will be no further checks of the translation unless the client specifically asks for this and pays for it as well. The above PEMT scenario assumes that this is a full edit, i.e. editors are supposed to remove all mistakes and produce a text that sounds as if it was translated by a human rather than a machine. In other words, they have to try to make a silk purse out of a sow’s ear. There’s also a PEMT service called a light edit. This is when editors only remove errors that would otherwise distort meaning, but many others are left in deliberately because they’re too costly to change at a light-edit price. Yes, you read that correctly. 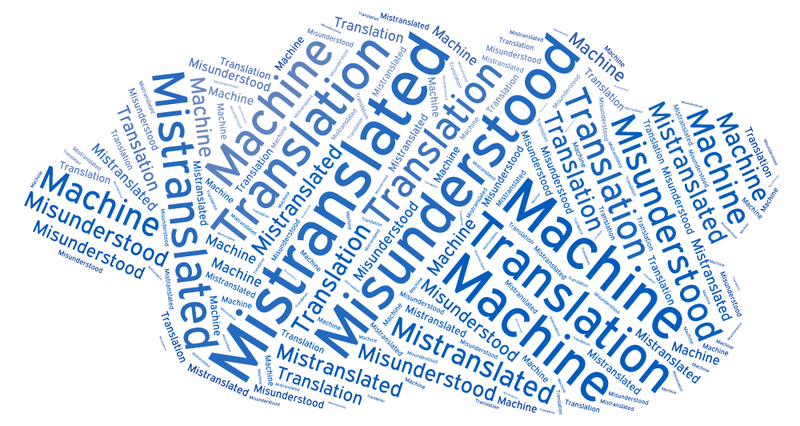 Not all the mistakes in the machine-translated text are rectified because the client prefers to cut corners to save a few pennies, even though an imperfect text will undoubtedly have a negative impact on people’s perceptions of the client’s products and services. I do hope you’re not that kind of client. I do hope you don’t support butchering our language by allowing the horrific outputs machines produce to populate our reading material. I should also mention pre-editing. This is a step that can come before MT. It involves cleaning up the text, removing in-house jargon, typing and grammatical errors and bad writing so that the machine can recognise what you’re saying better and thus produce a more comprehensible target text. 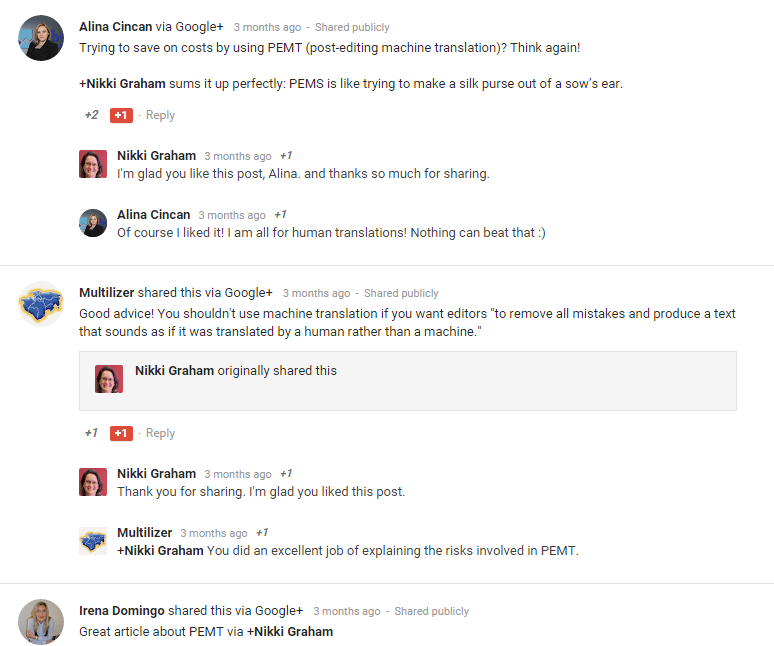 Of course human translators will just understand your message and correct any errors for you anyway as part of the service. And if they’re not sure for whatever reason, they will contact you and ask questions. Dialogue is often an important part of the process that can benefit both translator and client and help forge lasting and fruitful relationships. No doubt you will have realised by now that PEMT is an extremely laborious, soul-destroying and time-consuming process. 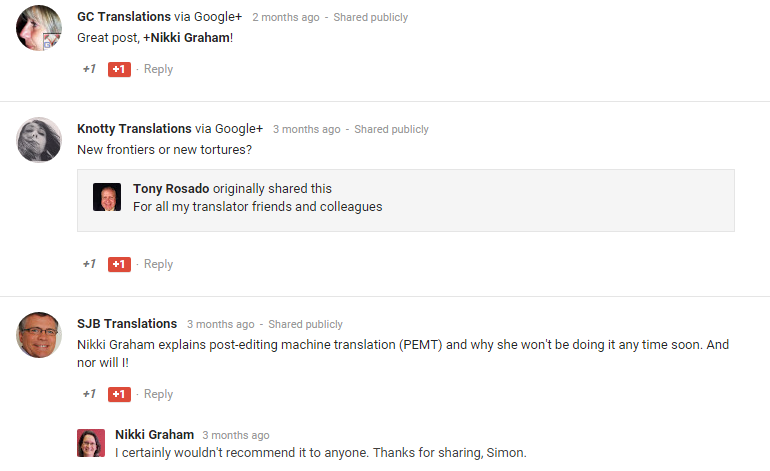 Having been tricked by clients hoping to cut costs into editing machine-translated texts once too often, I now have clear terms in place. If I discover that a client has used MT, and it certainly won’t escape my notice, I will halt the revision/edit and only proceed when there is an agreement to treat and charge for the job as if it were a translation from scratch. And of course all the time spent on the edit up to that point would have to be paid for as well. Use Google Translate and the like at your peril. You have been warned. 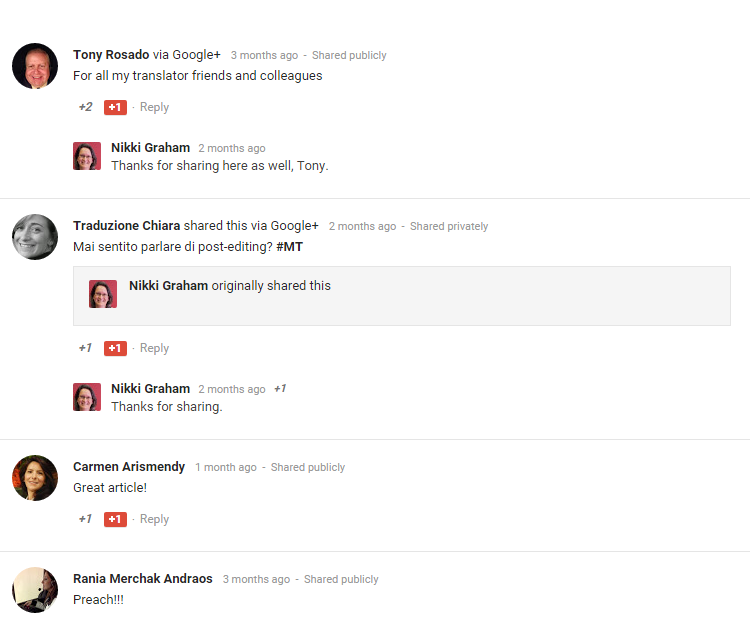 This post was first published on 24/02/2015 on my previous blog and also on 14/04/2015 as a Pulse post on LinkedIn, where it received a number of interesting comments.